Advancement of technology and the great sense of virtual connectivity, secured by the Internet, have seemingly brought everything within our reach. You no longer need to go to the Louvre museum to see Da Vinci’s Mona Lisa. You could simply go online and look at a virtual copy of it. You can even print out a high quality picture of it and hang it up in your living room if you want. Technology has influenced the daily life of average people and has provided households with tools that facilitate access and connectivity. These advancements have dramatically changed our culture. The fact that an average person could go online and connect to almost anywhere in the globe, access a load of information, and even add information and his/her interpretation to the pool of data online, really blurs the ideas of authenticity of ideas and information. Also, the fact that most common people have access to tools that allow for production and reproduction of works of art redefines issues of copyright. Downloading movies and music off the Internet is an example of that. Nowadays many people have the capability of illegally downloading almost any songs or recently released films. So issues of copyright start to become about refraining from an activity that you otherwise, with a little bit of effort, have the capacity of doing. Again this is an outcome of providing average people with efficient and easy-to-use tools at their disposal. But what one might find intriguing is the extent to which reproduction of an artwork diminishes the value of the artifact. Also, how accurately could one describe what is fake or what is real? Is copied article or a fake-real object without merit? 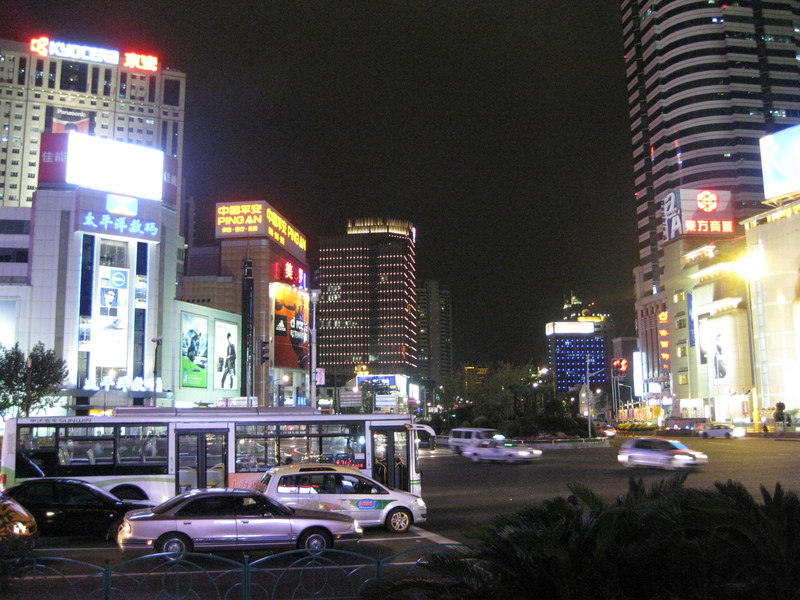 Dafen village, in Shenzhen China, is a great phenomenon to study. This community is mainly made up of artists whose occupations are replicating famous paintings of artists around the world, especially westerners. Looking at classical western art the value of the artifact was embedded in accurately and realistically depicting the subject matter and in doing so creating your own style and technique. In case of modern art the value of the work is understood in terms of the message the artist is trying to convey through the piece and, in many cases, the process of making that piece starts to have more importance than the final outcome. In the contrary to western art, what Dafen village artists are doing is not about originality of the artwork or the inserted message. Their skill lays in their astonishing ability to replicate. This is what distinctively sets western and Dafen village artists apart. One could argue that original artists of some of the reproduced paintings you would see in the village perhaps could not have replicated their work as accurately as these community based artists. An idea that really appealed to me is the way these local artists go about dealing with the issue of copyright. The Dafen village artists are all trained to copy a certain style or even a certain element in a painting (the eyes, the beard, etc.). So when producing a painting a number of these artists participate at the same time each drawing only a portion of the piece. The fact that the painting is reproduced through collaboration of multiple artists and not just one person is a loophole in dealing with copyright issues. The works of these artists really start to question the notion of authenticity and copyright. According to Walter Benjamin’s essay The work of Art in the Age of Mechanical Reproduction “reproduction of work of art jeopardizes its authenticity and authority”. But at the same time Dafen artists do not mechanically reproduce these famous artworks. The fact that these articles are painted by hand part of the painter’s soul gets engrained in the object through the process. In a way, the larger effect of the reproduced art in Dafen village is that it dilutes the halo of inviolability that surrounds the iconic artworks of our time, such as Da Vinci’s Mona Lisa, Van Gogh’s Starry Night, or Claude Monet’s Water Lilies. In other words, it makes art more accessible to public and great pieces of art are no longer that untouchable mystery. I tend to agree with Mr. Benjamin when he said “even the most perfect reproduction of a work of art is lacking in one element: its presence in time and space.” Yet what lends value to reproduced paintings of Dafen village is not their originality or authenticity but the mastery of these artists at the art of non-mechanical flawless duplication. Though 26 years old, the HSBC headquarters, designed by Norman Foster and Arup, remains quite unique and cutting edge in its structural design. It lacks the typical interior columns of most high rises, relying instead on a series of suspension trusses which the floors hang off of, allowing for an open floor plan throughout the building, a 40 meter tall atrium, as well as the building’s urban move: a virtually column-free ground floor that allows the public to move freely underneath. Today, the space is occupied every sunday by the migrant workers of Hong Kong. 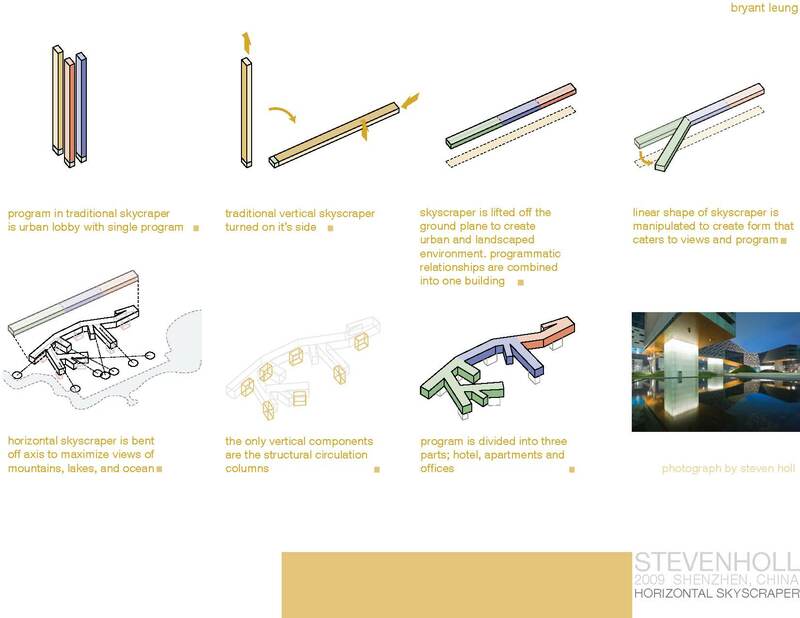 A reinterpretation on the vertical skyscraper typology, the horizontal skyscraper seeks integrate urban landscape into a skycraper’s program by lifting the program above the ground plane. 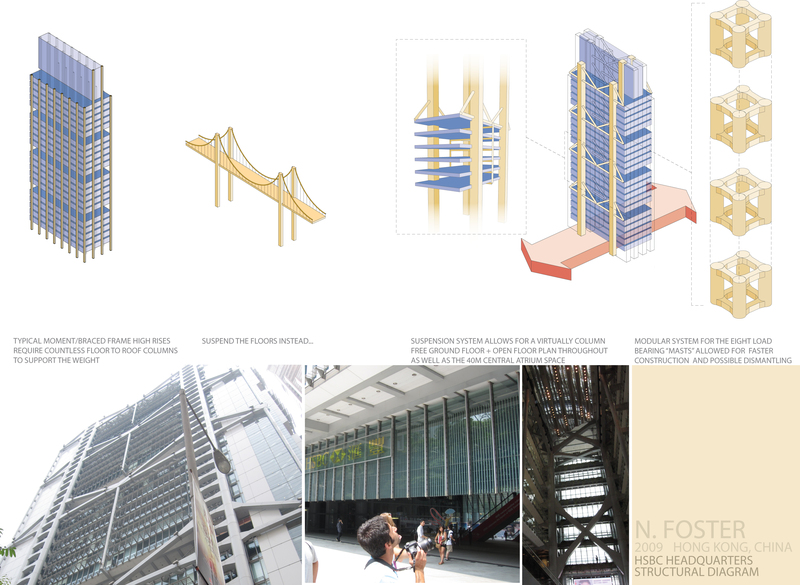 A formal manipulation on the vertical columns not only change the building formally, but it also seeks to address certain views for the users. Too often times do we associate the act of designing to simply an object and overlook the fact that it is the spaces between the individual objects that begin to shape our experiences. The city essentially is not object oriented in the scale of architecture, but functions as a collective whole with emphasis on the relationships between the various components within it, creating an urban narrative that gives meaning to its people. The existence of public open spaces therefore becomes an important component in stitching the city together and helping it function as a collective whole. One aspect of public open space can be found through the use of landscaped pedestrian walkways within the dense urban context. Peñalosa, the former mayor of Bogotá, discussed in his essay Politics, Power, Cities, the importance of public spaces as an urban equalizer, “In public spaces people meet as equals, stripped bare of their social hierarchies”. Public pedestrian spaces such as, parks, waterfronts, and promenades are all means to a more inclusive and in turn more collective society. These spaces show respect for human dignity regardless of the level of economic development of a society, and begin to compensate for inequality in other realms. 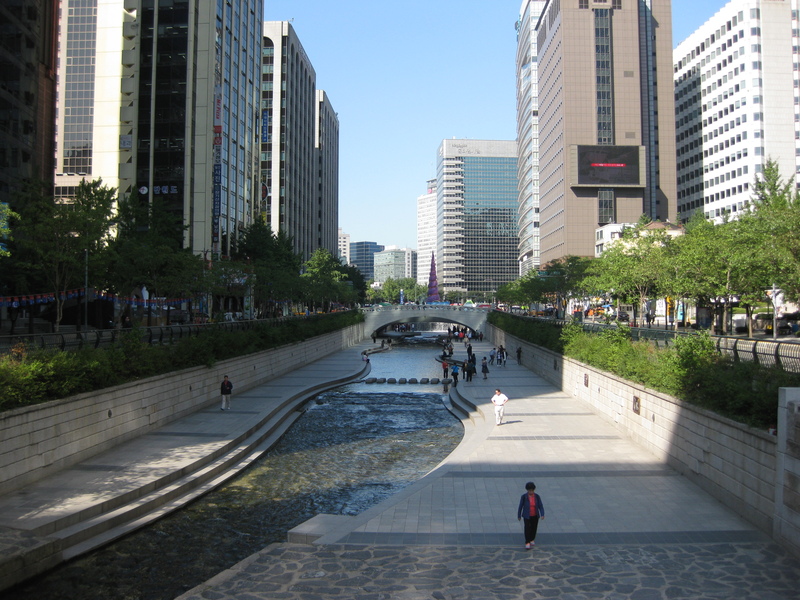 The restoration of the Cheonggyecheon stream in downtown Seoul is a successful case demonstrating how public green spaces have helped change the quality of life of its inhabitants. Contrary to its current state, during the early fifties, the Cheonggyecheon stream was a terribly filthy, trash-filled waterway when Korea was just beginning to run the course of industrialization. The stream became so deteriorated that the Korean government had the Cheonggyecheon covered up with concrete in 1958, and ten years later an elevated highway was built over the concrete in order to relieve traffic congestion in the city. For half a century, a dark tunnel of crumbling concrete encased more than three miles of a placid stream that bisects the bustling city, until former Seoul Mayor, Lee Myung-bak decided to liberate the Cheonggyecheon from its dark sheath and revert it back into a stream with green pedestrian corridors surrounding the exposed waters. Today, it has become one of the few places in downtown Seoul where all the citizens of the city can congregate together, you will find children playing with their parents, young couples strolling hand-in-hand, the elderly sitting on the park benches, and even the rich business elite eating lunch in the shade underneath one of the bridges. 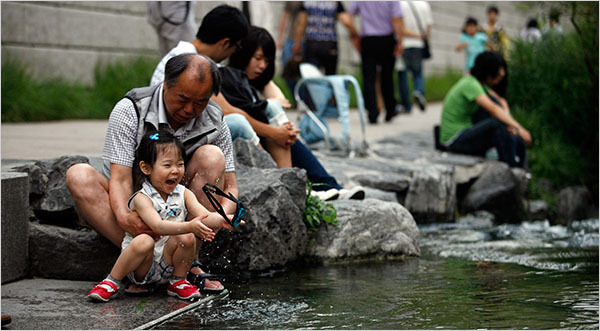 The stream has not only become a pedestrian space, but also a recreational space, a place for all the citizens of Seoul to enjoy. 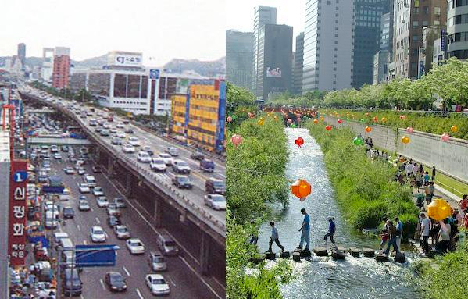 However, that is not to say the urban restoration of Cheonggyecheon came easily and without criticisms. The approximate cost for the restoration project was a whopping 384 million USD. It was a major undertaking as not only did they have to remove the highway, but also after years of neglect and development the original stream was nearly dried out – 120,000 tons of water had to be pumped in annually from the Han River, its tributaries, and the groundwater from subways in order to maintain its current state. In addition, there were also tremendous efforts made to compromise with the existing conditions, which involved hundreds of meetings with businesses and residents over a period of two years. 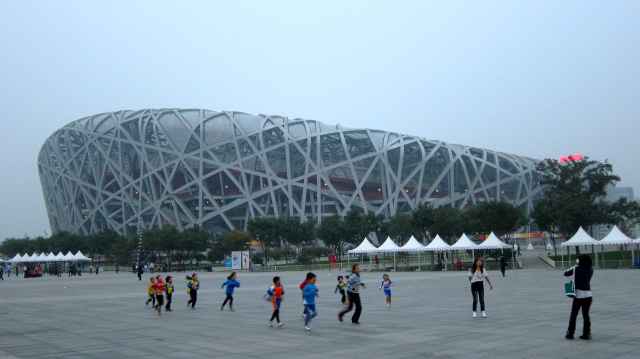 The main criticism the project received early on was that it was expensive and an “inefficient” form of urban renewal, because open spaces are essentially not programmed in the architectural sense, cost money to maintain, and have no direct revenue – all values that are deemed inefficient. However, is urbanism only about efficiency? And though it is important, does it have to be defined by completely optimizing efficiency? Quoting Yi, our professor in Seoul, “a city is not only about the performance, but also about the narrative. Performance is only functional, while narrative gives the city meaning”. As an urban equalizer, the Cheonggyecheon does bring about diversity and a greater sense of community for the people of Seoul to work towards a more collective society. One cannot argue the fact that after the Cheonggyecheon restoration project it has not increased the quality of life of its citizens as well as marketed the city of Seoul to the world, as it has become one of the signature landmarks of Seoul that is enjoyed by people of all ages as well as races. The form of the Seoul National University Museum of Art is influenced by the desire to physically connect the community to the University. Situated adjacent to the main entrance of the campus, the museum creates a node for SNU students and the surrounding community to interact. 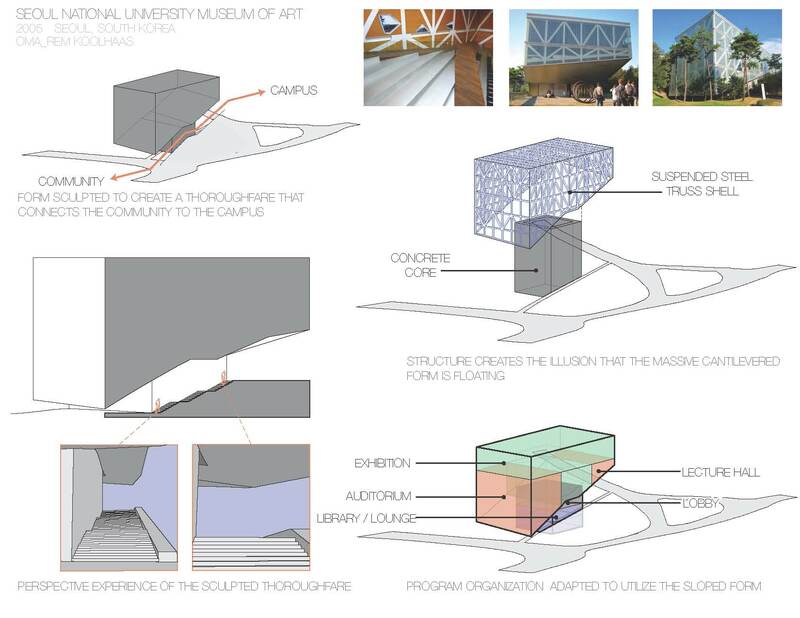 A pedestrian thoroughfare that links the campus to the community cuts into the side and underbelly of the mass defining the museum’s large cantilever. 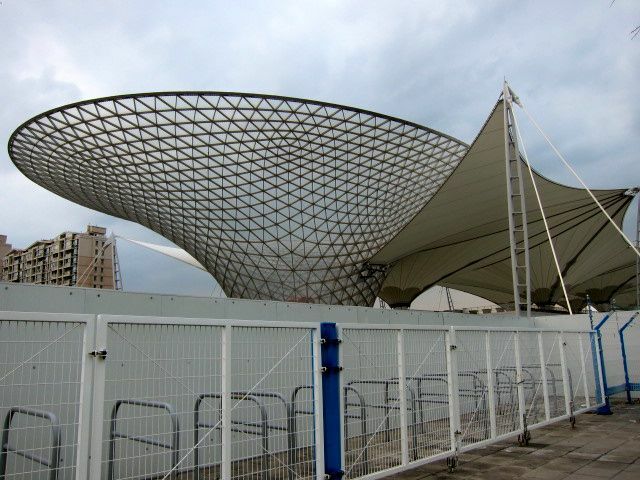 The cantilevered mass is composed of a steel truss shell that bears upon a central concrete core. This system gives the illusion that the cantilevered steel mass is floating, defining the large public space over which it extends. The museum’s interior programs are organized to accommodate the exterior cut of the pedestrian thoroughfare. Thus, the auditorium and lecture hall spaces are strategically placed to take advantage of the cantilever’s sloped underbelly, utilizing this incline to define the seating rake. 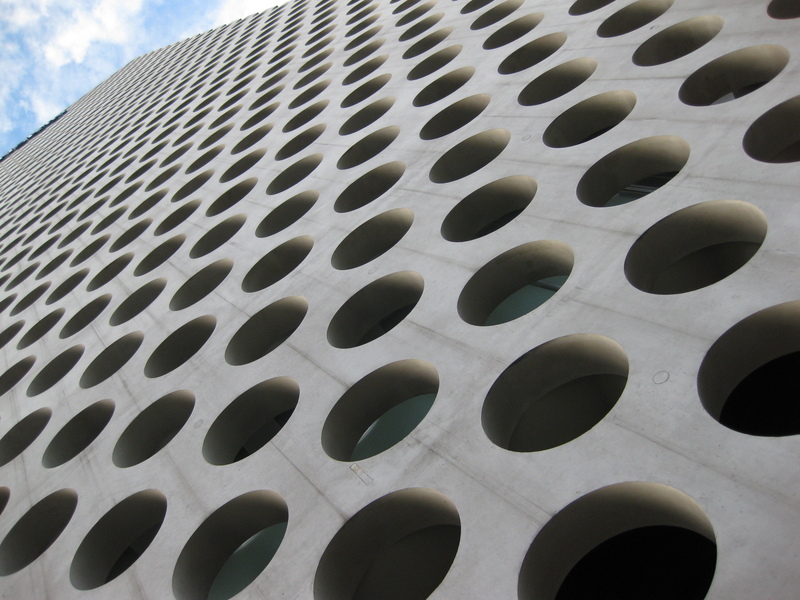 The concrete core encompasses the central circulation spiral and library. All of the various programs are connected and interact within this central axis. The porosity of the central core allows one activity to flow into the next without the limitation of doors. Together, the cut of the pedestrian thoroughfare and the structure that accommodates the cantilevered form define the space both inside and outside of the museum, creating a seamless procession of circulation and program.